The Ranga Lox Restaurant serves a range of Icelandic and French fusion cooking, along with an extensive wine list, in a modern, rustic setting with views of the mountains and glaciers, and guests can round off the day with a drink in the hotel bar. Guests can also luxuriate in the hotel's hot tubs, and embark on one of the activity programs including glacier tours, fishing, riding and golfing. The hotel offers wine tasting and cooking courses, and those on business can benefit from the function room with a range of audio-visual equipment. Practical amenities include complimentary onsite parking, dry cleaning, and a multilingual concierge service. The hotel is in an excellent position for exploring the surrounding area; Thorsmörk Preserve is 40 kilometres away, Thjorsadalur Valley, with its Viking remains, is 80 kilometres away, and the fascinating city of Reykjavik is at a 96 kilometre distance. The Hotel Fludir is a modern property with a stone and glass façade, located in the centre of Fludir, 15 kilometres from Skalholt. The hotel restaurant serves a range of international and regional dishes, including organically grown local vegetables, in a bright, modern setting with panoramic views. Guests can relax in front of the fireplace in the hotel lobby, and those with laptops can surf the web via the hotel's wireless Internet access. Guests arriving by car will find complimentary parking available onsite, and further practical amenities include a 24-hour front desk with safe-deposit box, room service and free onsite parking. The hotel is in a good position for exploring the area; the magnificent falls at Gullfoss and fascinating Geysir are 30 kilometres away, Thingvellir and Langjökull glacier are both 60 kilometres away, the volcano at Hekla is 150 kilometres distant. Reykjavik Keflavik Airport is also 150 kilometres away, and takes approximately 130 minutes to reach by car. Representing a superb base to explore Iceland's remote and haunting south coast, this hotel with comfortable accommodation is an ideal place for all type of travellers. The Icelandair Hotel Klaustur is in a peaceful spot on the edge of the tiny village of Kirkjubaejarklaustur with steep hillside on one side and sea on the other. This hotel offers comfortable and spacious guest rooms that are facilitated with an array of modern amenities to ensure you a memorable stay. Seating up to 150 people, the onsite restaurant serves varied delicious menu in a pleasant ambience. The relaxing atmosphere of the bar makes it an ideal place to relax with a fine drink after a tiring day. The Icelandair Hotel Klaustur also provides 4 well-appointed meeting rooms that can seat from 12 to 140 people for hosting any event or conferences. The village Kirkjubæjarklaustur (Icelandic: church farm cloister) is a town of approximately 160 inhabitants situated in the south of Iceland on the hringvegur (road no. 1 or Ring Road) between Vík í Mýrdal and Höfn. Its geographical location is what makes Kirkjubæjarklaustur better known than other villages its size. Kirkjubæjarklaustur is the only place between these two towns which offers services, including a fuel station, bank, post office and supermarket. 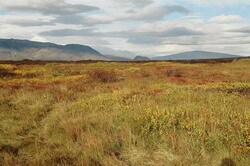 Nearby tourist attractions include the Laki craters, the Eldgjá and Skaftafell National Park. 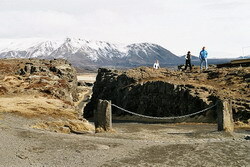 An attraction close to the village is Kirkjugólf (Churchfloor), a natural pavement of basalt. These are basalt columns in the earth, but only the top can be seen, and, as the name suggests, have the appearance of a paved church floor. This lava formation has similar origins to the Giant's Causeway in Ireland. All these attractions contribute to Kirkjubaejarklaustur being a popular stopping point for tourists. Thingvellir, or more correctly Þingvellir (Icelandic "Þing": parliament, "vellir": plains) is a place in the southwest of Iceland near the peninsula of Reykjanes and the Hengill volcanic area. 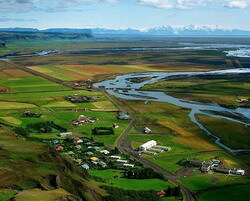 The valley is one of the most important places in Icelandic history. In the year 930, the Alþingi, one of the oldest parliamentary institutions of the world, was founded. 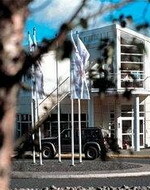 The Alþingi met yearly, where the Lawspeaker recited the law to all of the gathered people and decided disputes as well. Criminals were also punished at these assemblies; to this day, visitors can see the Drekkingarhylur ("drowning pool") in the river, where woman lawbreakers were drowned. In the year 999 or 1000 the Lawspeaker Þorgeir Ljósvetningagoði made Christianity the official religion of Iceland. After his conversion it is said that, upon returning from the Alþingi, Þorgeir then threw his statues of the old Norse gods into the waterfall that is now named Goðafoss ("Waterfall of the Gods"). At this historical place, the independence of the Republic of Iceland was proclaimed on June 17, 1944. Þingvellir became a national park in 1928 due to its historical importance, as well as the special tectonic and volcanic environment. The continental drift can be clearly seen in the cracks or faults which are traversing the region, the biggest one, Almannagjá, being a veritable canyon. This causes also the often measurable earthquakes in the area. Some of the rifts are full of surprisingly clear water. One, Nikulásargjá, is better known as Peningagjá (penny canyon), as it is littered with coins at its bottom. Throw in a coin, make a wish, and watch the coin carefully; legend has it that if you can see your coin hit the bottom it will come true. Þingvellir is situated on the northern shore of Þingvallavatn (assembly plains lake), the biggest lake of Iceland. The river Öxará traverses the national park and forms a waterfall at the Almannagjá, called Öxaráfoss. Together with the waterfall Gullfoss and the geysirs of Haukadalur, Þingvellir is part of the most famous sights of Iceland, the Golden Circle. 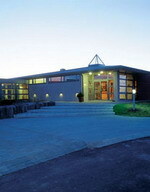 The park is also home to the summer residence of the Prime Minister of Iceland. Þingvellir is a designated UNESCO World Heritage Site.